The Religious Society of Friends (Quakers) emerged out of the theological dissension and turmoil of 17th century England. Our founder, George Fox, was a deeply spiritual person, earnestly seeking divine guidance. He was unable to find a home in the “steeple houses” of his day; their priests and ministers did not help him along his quest. One day he had an epiphany and heard a voice tell him “There is one, even Jesus Christ who can speak to thy condition.” That simple message transformed his life, was the foundation of his belief and has become the foundation of Quaker faith and action. By these simple statements he calls us to respect and treat all persons as our equals before God, regardless of race, gender, religious beliefs or social status. We are not to exploit, enslave, discriminate against or act violently towards any other human being. We are called to witness for peace, social justice and stewardship of our planet. There is a broad spectrum of worship practice among Quakers but all emphasize a time of expectant waiting on the leadings of the Holy Spirit. 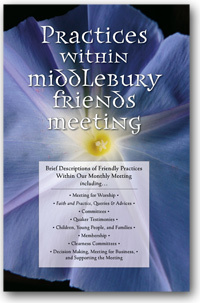 At Middlebury Friends Meeting we gather in that expectant but not empty silence: During worship, all present may speak or remain silent as they are moved by that Spirit. Before we were called Quakers (which name is a story by itself) Friends were often referred to as “Seekers after Truth.” We welcome any such seekers to our spiritual community.